Do you worry about second-rate service when it comes to appliance repair? Are you looking for an appliance repair team truly worthy of two thumbs up? Then it’s time to put down that refrigerator or dryer repair manual and contact A-Ok Appliance Parts & Service in New York’s Westchester region. With 45 years of experience in residential appliance repairs, we’ve built a sterling reputation for technical expertise coupled with top-notch customer care. So whether you need washing machine repair service for your suburban home or you’re seeking dishwasher repair for your city apartment or workplace kitchen, you can count on our factory-trained professionals to exceed your highest expectations. We work on virtually all major brands of residential appliances from Bosch to Sub-Zero, and we attend to every aspect of your appliance repairs, including quality replacement parts. When necessary, we even sell and install new appliances if the cost to repair your old unit makes buying a better option. Simply give us a call today or stop by our local appliance repair parts department to get started on your appliance repair. At A-Ok Appliance Parts & Service, we understand what a hardship it can be when your refrigerator ceases to cool or your oven fails to heat. That’s why we have more than a dozen skilled technicians on staff to provide you with prompt and accurate appliance repairs for your home or place of business. In fact, thanks to our convenient, on-site parts store and fully stocked company trucks, we make every effort to complete your kitchen and laundry appliance repairs in the same day of service. That’s a policy we pride ourselves on for all of your residential appliance repairs, regardless of make, model, size, or malfunction severity. From Maytag dryer repair to GE refrigerator repair, you can expect an effective and timely turnaround, as well as an honest price. Centrally located in the town of Eastchester, A-Ok Appliance Parts & Service is happy to serve the appliance repair needs of the entire vicinity of Westchester and Putnam counties in New York, including the Bronx, Yonkers, New Rochelle, White Plains, and Scarsdale. In addition, our family-owned and -operated appliance repair service goes the extra mile to assist the neighboring New Jersey communities of Bergen County and Hackensack, along with the Stamford area of Connecticut. If you live or work in any of these tri-state regions and you find yourself in need of appliance repair, don’t hesitate to call our friendly, knowledgeable personnel. We’re open six days a week to respond to all of your residential appliance repairs, including refrigerator repair, dryer repair, dishwasher repair, and more. For your complete peace of mind, A-Ok Appliance Parts & Service is fully insured as well as EPA certified for residential refrigerator repair. We even stand behind our professional appliance repairs with warranties on both parts and labor. That way, not only will you get thorough and efficient service with each and every appliance repair we handle, but you’ll also enjoy the assurance of a 90-day warranty on parts and labor. So don’t risk substandard workmanship the next time you require appliance repair. Instead, insist on the appliance repair team that’s been winning over Westchester property owners for nearly half a century. 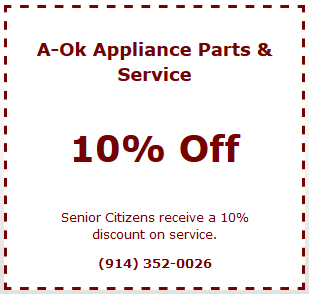 To schedule an appointment for your tri-state residence or workplace, just call or e-mail A-Ok Appliance Parts & Service today.